DIAMOND JUBILEE. The Wilson Street Methodist Sunday School, Long Gully, will begin the celebration of its 60th anniversary tomorrow, when sermons will be preached by Revs. A. P. Watsford, F. J. Flentje and W. H. Holtham. The music will be by 350 teachers and scholars, assisted by a powerful orchestra, under the leadership of Mr. R. J. Jennings. The annual tea and entertainment by the scholars will be given on Monday evening, and on Good Friday night the cantata "Esther" will be rendered by the church choir and others, under the baton of Mr. Ernest Thomas. Saturday evening will be devoted to a "Welcome Home" gathering, the guests being visiting friends and the parents of the scholars, and teachers and senior scholars the hosts and hostesses. The concluding services will be held on Easter Sunday, the preachers for that day being Rev. John Thomas, B A., and Mr. Hedley Thomas, of Melbourne, who, with Rev. F. J. Flentje are former scholars. 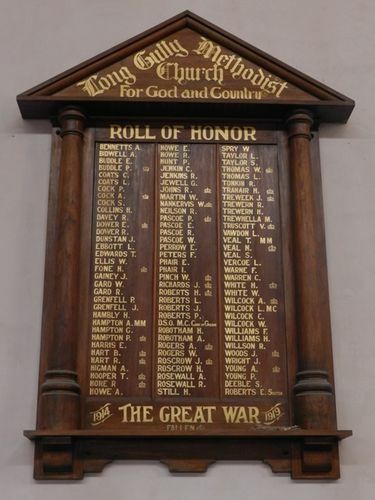 At the afternoon service the Honor Roll of the church and school, and a memorial tablet to one of the former scholars who has fallen in France will be unveiled. Bendigo Independent (VIC), 23 March 1918.